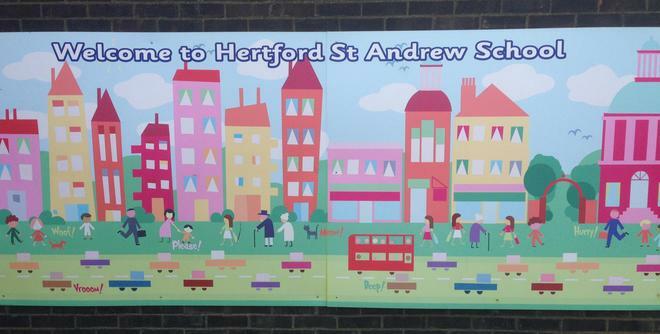 Welcome to the website of Hertford St Andrew Primary school, I hope you find it informative and helpful in discovering more about our school. Choosing the best possible educational opportunities for your child is a vitally important process. We hope you will enjoy finding out more about the opportunities and resources that are available for your children at Hertford St Andrew. Our concern for children means that whilst we place a great emphasis on standards of Maths, Literacy and other core subjects, we also aim to develop the whole child through our creative curriculum, as a result children at our school are enthusiastic, confident and independent learners. Everything that we do at Hertford St Andrew is underpinned by our Christian Ethos and Values. We are very proud of our inclusive practice and have high expectations and aspirations for all pupils. We have close links with Hertford St Andrew Church. The Reverend is very much part of the school and is actively involved in the school life as well as taking services and various assemblies. I hope too that you will want to visit Hertford St Andrew. I would very much like to meet you, but more importantly, I would like you to see the school and nursery, talk to the children and staff and experience first hand our passion for teaching and learning.